Volkswagen’s been releasing lots of plans for electric vehicles lately, no doubt because they’ve been forced to invest in EV infrastructure to help mitigate the damage they did with Dieselgate—it’s part of the company’s settlement agreement. So here’s a new electric van, complete with a press photo next to a renewable energy source. The e-Crafter is basically a VW Crafter cargo van with new lights, unique paint, a 100 kW electric motor, and a 43 kilowatt-hour battery pack consisting of 312 lithium-ion cells hidden below the cargo floor. 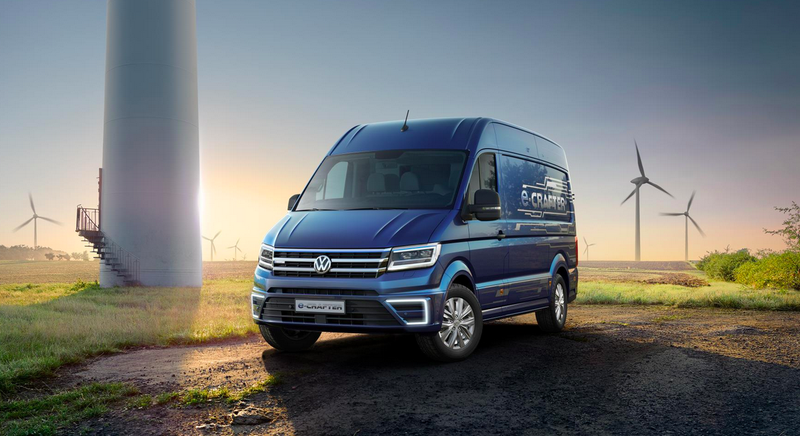 The van’s got a range of about 124 miles, but VW says the architecture can be reconfigured to allow a range of up to about 250. Those aren’t bad range numbers, but that’s probably because the thing is a snail. VW says the car is designed for “urban and inter-urban journeys,” which is another way of saying “this thing is slow.” Like, 49 MPH Top Speed slow. The good thing is that the cargo capacity is unchanged over the standard Crafter at 399 cubic feet, and that space can be filled with over 3,700 pounds of payload. Plus, the thing makes over 200 lb-ft of torque, and the battery can be charged to 85 percent capacity in only 45 minutes. Not bad. Keep the EVs coming, Volkswagen. But maybe crank up the speed a bit.